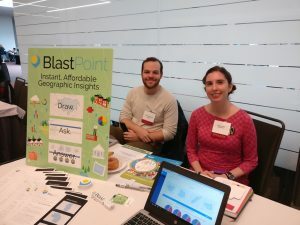 BlastPoint founders Alison Alvarez and Tomer Borenstein recently spoke at the Greater Pittsburgh Non-Profit Partnership (GPNP) Summit on October 5 with their talk entitled, Big Data: Uses in Other Fields, Application in Nonprofit. Alison and Tomer explored how large companies think about big data and how non-profits can translate these ideas into the purpose and mission of their operational and policy development – without the price tag of hiring experts or expensive analytic tools. The session covered concepts like indexing, segmentation, and forecasting, and showed how real examples from the world of marketing and analytics are within reach of anyone with the right tools. One of these tools, BlastPoint, produces a data visualization that can be used for presentations and proposals quickly – in a matter of minutes – saving hours of time and stress. Also included in the talk was an introduction to sources of free data and, for the technically savvy, access to a free iPython notebook.